One day I was getting ready to do a whole group alphabet activity. It was a simple 'swat the letter' game where you call out a letter name or sound and students take turns whacking the letter card with a fly-swatter. I was trying to decide which letters I wanted to focus on for this activity. I knew that I couldn't focus on all the letters of the alphabet because that would become too tiresome and I would let loose the ants in my kiddos pants. But--- which letters do I choose? I needed to know, as a whole, which letters my students were struggling with the most. But, now my curiosity was peaked. Which letters on average were giving students trouble? While were at it... which numbers, shapes and colors were learning curveball culprits as well? So, even though -data is not my favorite thing- I made it work. I created a template that can be used in Adobe Reader (free btw) where I enter the letters/numbers/shapes/colors that students could not identify on our most recent assessment. The form tallies up the number of students needing help with that particular skill. So, the higher the number in the total column = the letters I needed to focus on in circle time. My little data experiment totally worked and I can sleep better at night knowing I didn't just thrown caution (in this case alphabet letters) at the wall and hope I wasn't wasting time focusing on letters they already knew. And.....since I went to so much work - I need someone else to love on this little data collector too. It just feels nice when someone besides myself can use something I worked hard on. So, click below to get this Preschool Teacher's Data Collector - but promise me - you will open it in Adobe Reader (free - google it) - because if you don't, it will not work as planned! Now, go forth and collect that data teacher friend! You know how people say they have the memory of an elephant? Yea, that's not me. I think it is me, I wish it to be me- but when I face the hard facts my memory seems to be as bad as Dory's in Finding Nemo! So, I find myself making notes (shout-out to my best friend- the sticky note) all over the place. Can you feel me? Well, that same "Oh, I'll remember that" attitude crosses over to the classroom. Guess what? I just saw my little preschooler Gabby take the sorting bears from the math center and sort them by color and size at the same time! Um, this noteworthy! This should go in her portfolio ASAP! Wait, who is upset? Oh, I'm sorry my friend Ben, but we don't knock down other friends' towers. Yep, I got distracted (like I do 5,982 times a day) and I forgot all about that wonderful thing Gabby did earlier. I'm telling you what, a teacher's brain is pulled in so many different directions during the day, I truly wonder how I find my car at the end of the day! So, this brings me to note-taking, just like I do all over my house. But, this time I am using it in the my classroom to take note of those note-worthy events. All I have to do is jot down the student's name, date, materials and what I saw. Then, I can later look back at how Gabby just showed me that she can sort by 2 attributes. Plus, I can put that little note in her portfolio. Done. Need some help with your Preschool Assessments? Check out my new course! 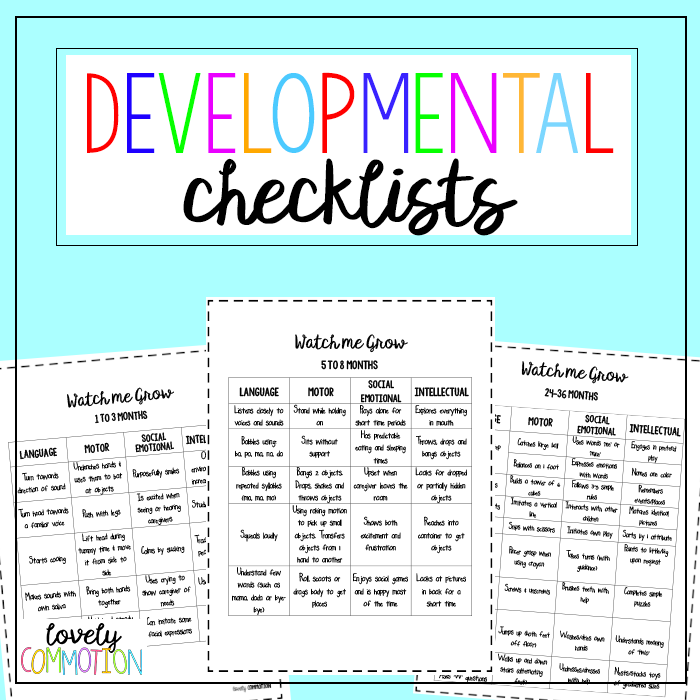 Early Childhood Developmental Checklists for parents, preschool teachers and caregivers. Do you have a child in your care that you want to make sure is on track developmentally? Eight years ago, as a new parent I was always concerned if my first born was meeting all her milestones. 'Concerned' may be an understatement - I was borderline obsessed with making sure I was giving her the best start to life. I mean, I know how important those first years are and I was bound not to jack it up! Lucky for me, I had just started a new position as a Parent Educator and was trained in helping parents provide experiences to help their children meet their developmental milestones. I had some really good tools in my toolbox, but even I felt the need to have a checklist --- there is something so gratifying about making a checkmark!!! Which experiences did I need to provide her with? How could I help her meet a milestone that she was struggling with? Well, first I had to see what she could do, then I would checkmark it with a highlighter. Serious Sidenote: I do not feel that drilling children with a million questions, asking them to name objects on flashcards or demanding they sit and 'practice' skills is AT ALL appropriate. I could see what she knew just by observing, playing and talking with her. After I knew what she knew, I could start providing her with the experiences/tools she needs. For example, if I want my child to feed herself with a spoon, then I have to provide the spoon and model how it is used. Without the spoon on the tray, she would never explore it and eventually learn to use it. If I want my child to be able to say 'more', I have to use the word over and over when the child wants more. You may be thinking, this all seems common-sense like. It is, but being a caregiver is hard and tiring. Why not take some of the guess work out of it?! You can get this freebie by clicking the link below. There are checklist for ages 0-36 months. Enjoy! This freebie appeared first as a part of the Take and Try Bi-Weekly Newsletter. Have you considered joining?